First off, you might notice things are a little different around here! I'm trying to spruce up the blog a bit so I have a new background and made myself a blog button (look to your right!). Big thanks to Cari from Cari Blogs for making me my super cute new banner! Thanks, Cari! I’m Jessica, an almost 11 year old book lover! I am a HUGE fan of the HARRY POTTER book series and have read each book about 5 times! A few months ago we went to the Wizarding World of Harry Potter, it was GREAT and Butterbeer is awesome! I like either Fantasy books or books about people a little older than me in the real world. Some of my favorite book series are ALICE by Phyllis Reynolds Naylor; MAXIMUM RIDE by James Patterson; PERCY JACKSON by Rick Riordan; and 39 CLUES by various authors. Some of my favorite books I have read lately that I don’t think are from a series are THE KNEEBONE BOY by Ellen Potter; IT’S RAINING CUPCAKES by Lisa Schroeder and THE LIMIT by Kristen Landon. There are a lot of books that my Mom has that I want to read too, when I am old enough, like TWILIGHT by Stephenie Meyer; The HUSH HUSH Saga by Becca Fitzpatrick and THE HUNGER GAMES by Suzanne Collins. My Mom took me to Philadelphia once to meet some authors, Holly Black and Cassandra Clare (we had to sit in the car for a long time after we met them because my dad and brother wasted the battery and we had to wait for a man to come fix it). I bought THE SPIDERWICK CHRONICLES (Book 1 The Field Guide) by Holly Black before the event and read the whole thing while the authors were talking. She signed my copy and I am proud to have it on my bookshelf. I also have a signed copy of 39 CLUES by Linda Sue Park. I would like to get more signed books in the future. Thank you to my Mom’s friend for sharing my bookshelf on her blog “Stephanie, A History”. I LOVE the pictures of Stephanie’s bookshelves and I am inspired to get lots of bookshelves and fill them up! 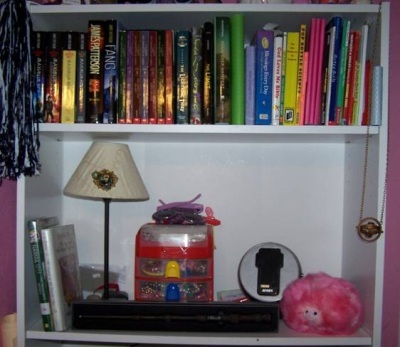 My bottom shelf is sort of random, there’s craft stuff, dictionaries, notebooks and other stuff like that. 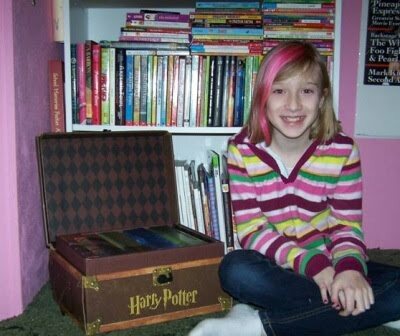 But in front of it you can see I have a trunk of the HARRY POTTER books. The next shelf (going up) is some short chapter books, not really long books. 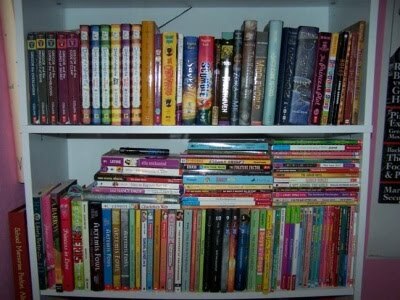 Some of my favorite books from this shelf are the 39 CLUES books, books from the ALICE series and the MaryKate and Ashley books. The next shelf has longer chapter books like DIARY OF A WIMPY KID and GREGOR the OVERLANDER series. I have the next shelf for my jewelry and music – my iPod is there. I also have my favorite souvenirs from our trip to the HARRY POTTER Park, Dumbledore’s wand, my RON pin, my Pigmy Puff and a time turner necklace that my Aunt gave me a few years ago. The top shelf has a little something from every shelf! It’s kind of a spot for things that just couldn’t fit on the right shelf. Jessica thank you so much for letting me feature your bookshelves today! You say that I'm an inspiration to you, but know that you're an inspiration to me, too. I hope you're able to fill your shelves with even more books and that your mom is able to take you to many more book signings. Great Bookshelf! Very nicely kept. Love it when I see children excited aobut reading, seeing authors and such! She is a cute girl and only wish I was as enthusiastic about reading when I was her age. Ok she sounds precious! Great bookshelf! Love the new blog look, Stephanie! Great bookshelves. And I love her hair, too.